While relaxed execution is a required feature of the finished horse, it is also essential to avoid ‘sub-optimizing’ around this feature during training if we hope to make an expeditious progress toward high school training. Henry Fleming & Quietude Homeward, owned by Amanda Spreen, work on the jaw flexion. Hillsboro WV, 2014. It is important to distinguish the original intent and context surrounding the notion and emphasis upon the horse’s state of “relaxation” and the avoidance of “contraction” when it comes to developing the high school horse. Too much of a good thing, as they say, can often be a bad thing – even patience itself, according to General L’Hotte, whose advice I heed religiously. In the case of relaxation and contraction, I think the terms are often misapplied to horses in training, and over used as a crutch with students in the arena, where contraction has become akin to animal abuse, and getting the horse to nirvana can consume most of the time for every lesson. William Cavendish wanted the horse stall-kept and fresh for his brief lesson (yes, he liked them “stoned” – but of course this referred to stallions in his day). He clearly desired ample energy in his manege horses. Baucher opposed the notion of tiring the horse on the long line in advance of brief but frequent (twice per day) working sessions. The horse’s energy, in his view, needed to be preserved as a precious resource, excesses dealt with directly and controlled through education – never avoided through exhaustion. He warns this will do nothing to resolve bad behavior long term – eventually the animal’s wind and vice will return, and strengthened for the extra exercise. Both masters were in pursuit of brilliant gaits – not the resigned, bored, movement which often passes for “relaxed” gaits in modern dressage (and often at the expense of progressing education) – the extension of such gaits notwithstanding because, as Jean-Claude Racinet emphasizes repeatedly – backed both by history and common sense – collection – not extension – has been the ecuyer’s grail from the beginning of high equitation. Nuno Oliveira was especially proud of his pupils’ ability to move from complete immobility to any gait instantaneously – to him, immobility itself becomes an air in itself. This is not a resigned immobility, nor even one we might think of as especially “relaxed”. It is a highly focused immobility, poised to address a multivariate near term – all the while remaining still, awaiting any indication to leak into one step of a short walk, or burst into an extended canter on a specific hand. To witness the air of ‘immobility’, skip the billion pony club “dressage tests” on Youtube, and let Pablo Hermoso de Mendoza demonstrate why high equitation was born and why. Of course I do not intend to promote the presentation of insecure, contracted horses. Of course confirmed movements should be executed with calm and grace. But I am addressing the matter of schooling – the issue of ever achieving your horse’s early drafts of the piaffe, passage, pirouette, and lead changes. 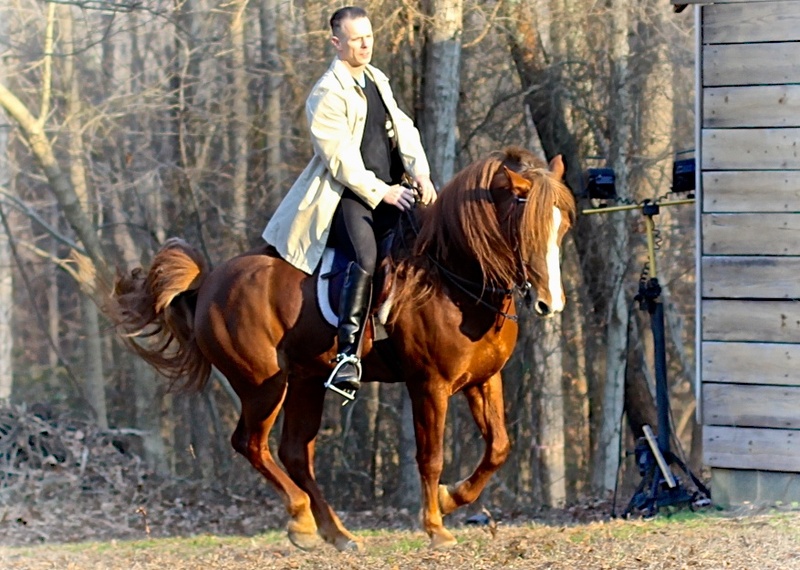 The path to these movements – at least to their classical ideals – requires an abundance of energy on the part of the horse, and during early days (get ready – I’m going to say it) we may even leverage nervous energy to make the first hop to a rough sketch of a to-be-improved movement or figure. Isn’t this common sense, really? Remember your first timid jump off the high dive? The fact your first jump was not a Zen ideal did not prevent your last jump from being quite relaxed and fun – on the contrary, it had to precede it. Your first attempt at public speaking? You’re getting anxious just remembering it. Had you avoided ever trying until you could do it in a perfectly relaxed manner, you would have never made it to the podium. I think it is far more useful to think in terms of Baucher’s resistance. This is quite an exact term, and it obviates the need, I believe, for unhelpful generalizations which are most often used to vaguely describe the obvious – to describe a generalized symptom of a more specific (though less obvious) cause, which, in every case, is initially a resistance. From a Baucherist perspective, if there is no resistance on the part of the horse, then any apparent contraction is ipso facto caused by the operator, not the instrument. In exhibition, of course, a fault is a “fault” regardless. In a training context, however, if no resistances are discernible to the trainer, then no training is occurring. In such a case, one is guilty of sheepishly avoiding resistances and performing for the gallery; or is unable to sense them; else has accidentally completely finished a perfect manege horse who no longer presents any resistances (presuming sound health and expert operation). Right? And with that I’m off to transfer my anxiety to an innocent quadruped. Rassemble.